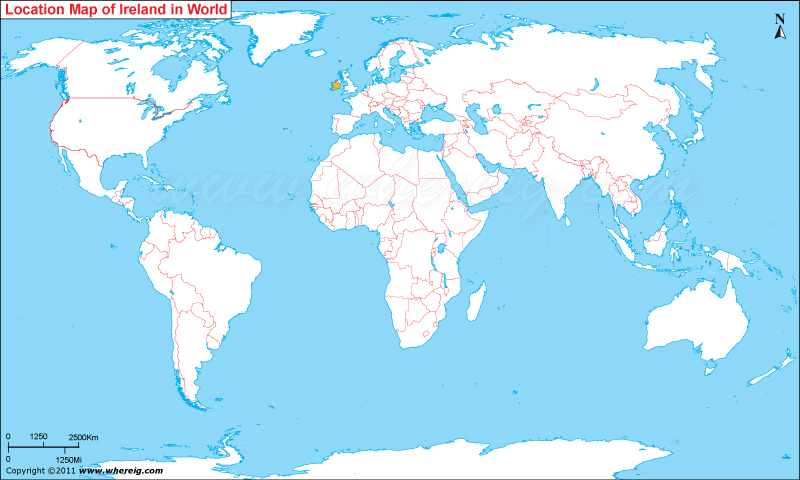 Where is Ireland located on the world map? The given map of Ireland shows the accurate geographical position of Ireland on the world map. As Ireland location map illustrates that Ireland is located in the northwest of Europe continent and west of Great Britain. The Ireland is island country in the Atlantic Ocean. The country is surrounded by the hundreds of small and medium size islands. In the west of country, Atlantic Ocean lies and in the east Irish Sea lies; however, the island has tow part first one is northern territory of Ireland is known as Northern Ireland where Great Britain has exclusive sovereignty and second one is southern territory, which is known as Republic of Ireland. On the land of Republic of Ireland, the counties of Ireland collectively constitute the basis of the system of local government. However, some of the bigger counties further subdivided into smaller administrative regions. Geography of Ireland is quite significant; the low height mountains surrounding a central plain along with several navigable rivers give the territory beautiful natural landscapes. The island has lush vegetation. The country has oceanic climate with changeable characteristics. Irish has had very unique culture that has also imprinted on the Ireland's literature and other fields of development. Irish language and Irish music are the most common and known to the world because of their popularity. Moreover, the country is popular tourist's destination of the Europe. The important Ireland tourist places are: The capital city Dublin - Dublin is most visited place in the country due to the popular tourist's attraction i.e. Guinness Storehouse and Book of Kells. Three World Heritage Sites: the Bru na Boinne, the Giant's Causeway, and Skellig Michael. Other most visited tourist's attractions are Bunratty Castle, the Rock of Cashel, the Cliffs of Moher, Blarney Castle, Holy Cross Abbey, Lakes of Killarney, Dingle peninsula etc.